Notes for Notes is an amazing program dedicated to providing free access for youth to musical instruments, instruction, and music-making environments so that music can become a profoundly positive influence in their lives. They have offered to provide our program with a couple of free private classes for small groups (up to 4) of mentees and their mentors in one (or potentially more) of the following: guitar, electric drums, electric keyboard, vocals, and/or mixing. Students are encouraged to sign up for free memberships afterwards and continue their lessons (all free!) with the potential to lay their own track (record a song). There are also DJ turntables (vinyl and iPod) for the DJs in the making! Let me know if you are interested in attending a class with your mentee, and give me a list of days that work best for you around 3 PM and we will work together to make it happen!! This is an incredible opportunity for your mentee to express themselves through music. With their membership at the MusicBox, they are also likely to meet rockstars and develop their own sound. Notes for Notes hosts various workshops as well. They recently held one that brought in a composer who does the music in movies like Jaws, Mission Impossible 2, and Liar, Liar. For more information, please look at their website. Memberships to the local Boys and Girls Clubs are now available for free to our mentees. Please contact one of the following clubs for applications and mention that your mentee is a part of the Fighting Back Mentor Program. Applications must be signed by the parent or legal guardian of your mentee. You may use the facility together as well if you'd like to have your one hour meetings there! Take advantage of the many things they have available for our youth, including free tutoring at some of the clubs. Mentor Training: "Fidget to Focus: How to work with youth affected by ADD/ADHD"
Please join us for this informative presentation by nationally recognized expert on ADD and ADHD in children and adolescents, Dr. Rotz. For 15 years he has focused his attention on establishing and maintaining effective treatment strategies for children, adolescents, and adults with ADD. For more information about Dr. Rotz and the Lifespan Development Center, please visit his website at http://www.docrotz.com/. Please RSVP no later than Monday, November 9th. Space is limited! This Holiday season, please consider instilling in your mentee the gift of volunteerism. They are given so much that it would be wonderful for them to have the opportunity to help others in their community. Yearly over 1,600 children spend time in the "Free Store" as they help their low-income neighbors. They love the experience and they learn how to work in a real store. The "Vision of Unity" Tour will be an opportunity for you and your mentee to see the facility and what the Unity Shoppe does. You will then be able to register as a volunteer and can drop in at any time Monday through Friday and sign in. These volunteer hours are also good for high school students who need the hours to graduate! We are also planning on going as a group in December to volunteer together during the busy holiday season. Details to follow for that. There will be cookies and lemonade provided for all who attend this tour. 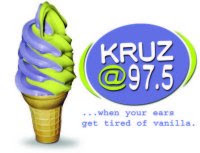 Join us for a tour of a local radio station playing today's "adult alternative", rock and pop songs. They'll get to meet a DJ and see what goes on behind the scenes at a radio station. Let your mentees know that there will be giveaways!! Please RSVP no later than Tuesday, November 17th. Space is limited!! Direct from The Magic Castle and the Las Vegas strip: It’s Magic! This all-star stage revue features the best magical acts – from jaw-dropping sleight of hand and off-beat (often wacky) comedic magic to mind-boggling full stage illusions. Producers Milt Larsen and Terry Hill present some of the most prestigious prestidigitators to delight audiences of all ages. “The liveliest lineup of magic acts this side of Las Vegas in an all new show. It’s a must for magic buffs of all ages!” says the L.A. Times. The Lobero Theater is donating tickets to a limited number of mentors and mentees (a $15-$30 value). There will be 2 shows on Saturday, November 7th: 2 PM and 7 PM. Let your case manager know ASAP if you and your mentee would like to attend. The First Tee is offering full scholarships (a $75-$100 value) to some of our mentees. If you feel that your mentee would benefit from enrollment in this program, please contact your case manager (Juliana or Anna) for more information. Classes are being offered on Tuesdays at the Municipal Golf Course (3500 McCaw Ave.) and on Thursdays at Twin Lakes Golf Course (6034 Hollister Ave.) from 3:30-5 PM. Mentors can stay and encourage and support their mentees during that time. October Mentor of the Month! Joanie Grissom has mentored for over 6 years. Her mentee is a 10th grade student at Santa Barbara High School. Joanie and her mentee have participated in a wide range of activities from reading together, making pottery, going to the beach, shopping in Paseo Nuevo, visiting the Botanical Gardens, and going to the movies. Her mentee comes from a family where her mother has been absent for much of her life, making Joanie’s role as a female mentor even more vital to her mentee’s development. Two years ago, her mentee became part of a leadership group at her school, and Joanie has helped guide her into doing community service for SBHS. Her mentee has been exposed to these positive outlets throughout most of her teens because of Joanie’s hard work and dedicated as a positive role model. Joanie has been able to assist her mentee through most of her high school career, no doubt making a life long impact. Joanie is also a member of the Mentor Task Force, highlighting her compassion and dedication to the cause. She is one of our mentors who truly goes above and beyond, and serves as a great example of how mentorship can change the life of a child for the better. Nice job, Joanie! RSVP by Friday, October 23rd! When we attended this station about a year and a half ago, it was nothing short of fantastic! We anticipate it will be a great opportunity for your mentee to learn more about the real lives of firefighters (men and women!). This is an interactive field trip with a lot of stories, laughs, and fun. 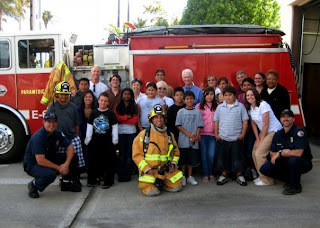 Your mentee may even have the opportunity to put on real fire fighting gear! Hope to see many of you there!! Mentor Training: "Youth in Crisis: The Role of a Mentor"
Council on Alcoholism and Drug Abuse - 232 E. Canon Perdido St.
What is crisis? How do adolescents respond to crisis? How can adults provide support during crisis, especially in the role of a mentor? What can a mentor really do? Find out the answers to these questions and the questions you have about youth crisis at this mentor training. Feel free to submit your questions ahead of time and I'll share them with the speaker. Speaker: Mark Watson, Director of Shelter Services at Noah’s Anchorage. Noah’s Anchorage is a local youth crisis shelter, serving 10-17 year olds who are in need of crisis counseling, temporary shelter, and food and clothing. Mark holds his Masters in Social Work from the University of Northern Iowa and has been in his current position for about 6 years. He has worked with at-risk youth for over ten years and has a passion for helping to empower the youth struggling to find their voice in this world. Encourage Your Mentees to Get Involved!! 1st You Grow Girl Conference sponsored in part by Girls Inc. and the Girl Scouts is a day entirely for girls in the 4th-8th grades, their parents and other caring adults on Saturday, October 24th from 8:30 AM to 3 PM. The workshops for the girls encourage self-confidence, strength, and independence. The adult workshops focus on communication with girls and how you can continue to be an influential part of their life. 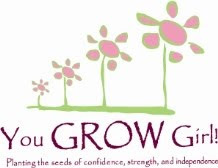 For more information on workshops and for registration forms, please see Your Grow Girl or call Jen Bowman at (805) 963-4757 x17. Tickets are $10 each. Full scholarships are available to mentors and their mentees; please call Jen for more information about these. 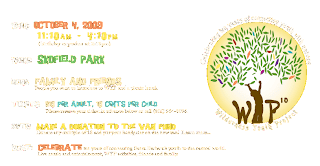 10th Anniversary Wilderness Youth Project at Skofield Park on Sunday, October 4th from 11:10 AM to 4:10 PM. Live music and entertainment. Bring family, freinds, and a picnic lunch! Tickets are $10/ adult and 10 cents per child. You can reserve your ticket in advance by calling (805) 964-8096 or by going to www.wyp.org/tenth to find out more about this celebration!! 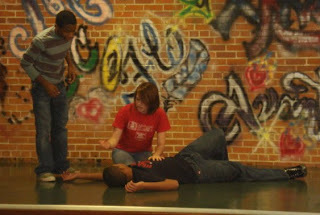 City at Peace is a youth program that uses the performing arts to teach and promote cross-cultural understanding, leadership skills, and non-violent conflict resolution. The program starts Wednesday, Oct. 7, 2009, and meets every Wednesday from 4-8 PM at the Lobero Rehearsal Hall (33 East Canon Perdido St.). They are seeking a diverse group of youth (ages 13-19) interested in self-expression through theater, poetry, storytelling, & music, in issues of diversity and peace, and who are hoping to make their community a better place. The Prudential Spirit of Community Awards program is the United States' largest youth recognition program based exclusively on volunteer community service. The program's goals are to applaud young people who already are making a positive difference in their towns and neighborhoods, and to inspire others to think about how they might contribute to their communities. Any student enrolled in grades 5-12 are eligible, with minimal restrictions. The top State honorees receive a $1000 cash award; the 10 top national honorees receive a $5000 cash reward. Katee Grace has made our BBQ pictures into a slideshow for you all to enjoy! Find it here: http://belleinnocence.com/#/mentorbbq2009/ And don't forget that you can download your favorite pictures at: Katee Grace Smugmug.